If you visited us on Pinterest over the weekend, you may have noticed that something looked kind of off and that all our pins were gone. Yup. That was on purpose. Don’t worry, I haven’t lost my mind yet. You see, as a blogger, there’s so much pressure to do well on Pinterest. 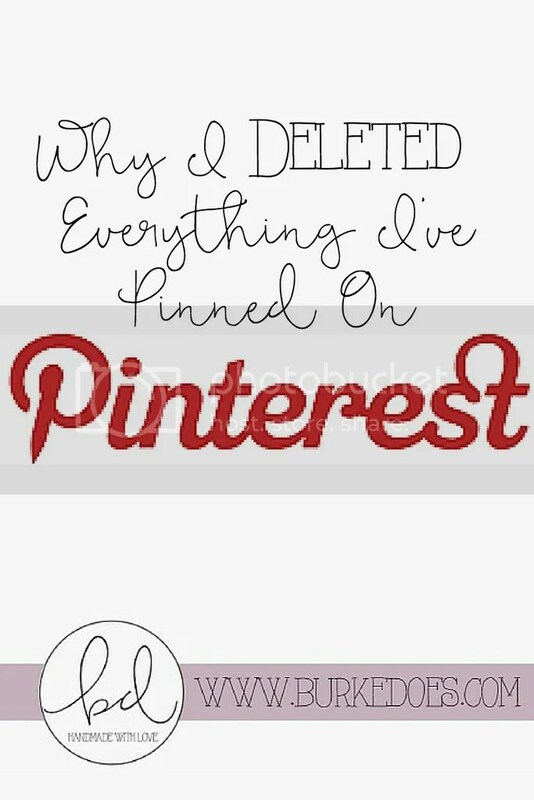 Everyone says that Pinterest can be your number one source of traffic and blah blah blah. There are all these rules and strategies for “optimizing your Pinterest reach” and somewhere along the way I lost sight of what I wanted Pinterest to be for. Last week, I decide that I had had enough and was going to restart. And I’m going to tell you what the Burke Does Pinterest page (which you can find here) is about. You’ll find our Pins because we want to make sure people who are interested in finding the things we post about can. You’ll also find things we’re interested in trying or making and awesome tips from other bloggers. Here’s what you won’t find- There will be no pinning for the sake of pinning. Those pin for pin threads around the blogging world- nope, none of that. There will be no pinning because I need to be pinning 10-20 times per day. If I don’t like it, if it’s not something I think is representative of Burke Does, of who we are and what we’re trying to share, then I’m not pinning it. Period. This mean you won’t see “Mommy” pins- we’re both 20-somethings with no kids, why would we pin about kids? No wedding pins either. Neither of us is there yet. We’re pinning things that are relevant to us and hopefully, to you, because we’re sharing our life with you. That’s the point of this, our little space on the internet, anyway. So help us start rebuilding our pinterest by pinning the image above!